Candida albicans, also called thrush, candidiasis or candida, is a yeast that is commonly found in the human gut. It does not proliferate outside the human body. It is found in the gastrointestinal tract and mouth in 40-60% of healthy adults. Candida is a potential pathogen, meaning that as far as it is under control it’s ok but if it gets out of control then it transforms into a pathogen and can cause problems in the whole body. 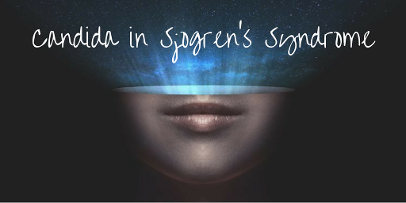 A June 2018 study into the Oral yeast colonization in patients with primary and secondary Sjögren's syndrome has discovered that yeast in the mouth's of patients with Sjogren’s syndrome has a different pattern than healthy people. Brazilian researchers investigated pattern of yeast colonization in mouths of patients with primary and secondary Sjögren’s syndrome. The study showed that Candida albicans is the most prevalent yeast, but also that a variety of other yeast species can colonize the oral cavity of Sjogren's syndrome patients. Saliva and swab specimens were collected from 15 patients with primary Sjögren’s and 15 patients with secondary Sjögren’s, and 15 healthy people. Yeast species were identified using two methods – culture and DNA sequencing. Despite lower diversity in species, patients with both primary and secondary disease had higher total counts for yeast, as well as higher total counts of C. albicans, compared with the control group. Results from this study allowed researchers to identify potential fungal pathogens that colonize the oral cavity of Sjögren’s patients, and could be contributing to the abnormal immune environment in those patients. Any person with a weakened immune system is more likely to develop candida. This includes infants, children, the elderly, those with inflammatory and autoimmune conditions such as Sjogren's Syndrome. There are more than 200 species of candida, but few of them have been associated with human infections except for C. albicans. In recent years, the number of clinical infections caused by Candida species worldwide has risen considerably, and the incidence of resistance to traditional antifungal therapies is also increasing. There is a need for different antifungal remedies, and plants remain a vital source of these new substances, especially in low-resource countries. Many plant extracts and essential oils can fight against Candida species and show that medicinal plants can be a rich source of potential antifungal compounds. "Among the most worrying microorganisms, species from the genus Candida have exhibited a high rate of resistance to antifungal drugs. Therefore, the objective of this review is to show that the use of natural products, along with conventional antifungal therapy, can be a very promising strategy to overcome microbial multiresistance. Some promising alternatives are essential oils of Melaleuca alternifolia, lactoferrin (a peptide isolated from milk) and chitosan. Such products have great potential to increase antifungal therapy efficacy, mitigate side effects and provide a wide range of action in antifungal therapy." © 2017 Sociedade Brasileira de Microbiologia. Published by Elsevier Editora Ltda. Antibiotics do not kill off Candida they kill bateria. Following is a selection of suggestions from around the web. Starve the yeast - for 2 weeks have no sugar, no fruit, no milk. No yeast-containing foods such as alcohol. Get rid of the remaining yeast - could take a month. Candida can adapt to individual antifungals over time, so many dieters choose to take multiple antifungal supplements at the same time. Some options suggested are caprylic acid, olive leaf extract, garlic, grapefruit seed extract and oil of oregano. Re populate the gut with good bacteria - Probiotics and fermented foods. Coconut oil - Unrefined Coconut oil is a saturated fat that contains properties beneficial to Candida sufferers. It is which are anti-bacterial, anti-viral and anti-fungal and can help kill off yeast overgrowth. Carbohydrates - Low carbohydrate consumption is an important aspect of a diet to control Candida since high carbohydrate foods feed the Candida. Vegetables - Some vegetables can help stop the growth of Candida such as raw garlic, onions, horseradish, cabbage, broccoli, turnips, and kale. Raw apple cider vinegar - Take a tablespoon of apple cider vinegar and mix it with a glass of water and drink before every meal. Milk thistle - helps to cleanse the liver of prescription medications including steroids, birth control, antibiotics, environmental pollution, heavy metals, and the remnants of chemotherapy and radiation. Rosemary Oil - Essential oil of Rosmarinus officinalis showed anti-adherent activity of C. albicans. Tea Tree Oil - Melaleuca alternifolia belongs to the Myrtace and has antibacterial, antiviral and antifungal action. What are the therapies Dr. Weil recommends? In addition to oral or topical antifungal treatments, other natural options include taking a proven probiotic product to help restore normal gut flora, cutting back on refined sugars, avoiding dairy products, and eating one clove of garlic per day, preferably raw. In addition, take probiotics whenever you are taking antibiotics. An herb that may help is thyme, which is approved in Europe for use in upper respiratory infections and is effective against oral thrush. Thrush, Dr Andrew Weil, MD. Interactions between Candida Species and Bacteria in Mixed Infections H. F. Jenkinson, L. J. Douglas. NCBI. Anti-adherent activity of Rosmarinus officinalis essential oil on Candida albicans: An SEM analysis. Cavalcanti YW, Almeida LD, Padilha WW. Rev Odonto Ciênc. Lactoferrin, chitosan and Melaleuca alternifolia—natural products that show promise in candidiasis treatment. Lorena de Oliveira Felipe , Willer Ferreira da Silva Júnior, Katialaine Corrêa de Araújo, Daniela Leite Fabrino Universidade Federal de São João del-Rei/Campus Alto Paraopeba, Minas Gerais, MG, Brazil, November 2017. This is a medical condition and you need to see your medical practitioner to have it diagnosed and treated. If you suspect Candida, please talk to your doctors. There are simple and reliable tests for diagnosing it. Sometimes a doctor can diagnose it visually, or it can be done in a lab. The same goes for treatments. Effective antifungal treatments exist. The information here about diet and supplements is not a recommendation but just a collection from other sites listed in the Sources at the bottom of this page.